... 1. Blow up a balloon. 2. 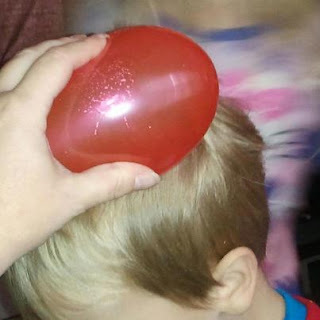 Rub the balloon all over your hair to make it static! 3. Turn on your faucet so that a constant but small stream of water comes out. 4. 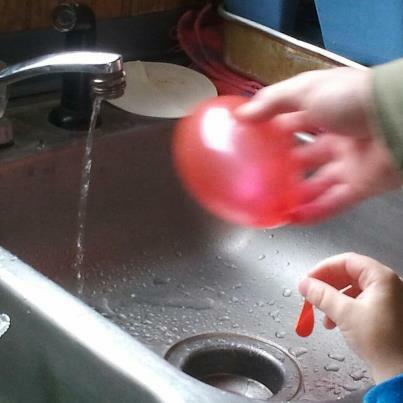 Move your balloon very close to the stream of water but make sure that you don’t touch the water. 5. Observe what happens to the stream of water! Post your results with photos! We will post experiment explanations on Mondays, but look forward to hearing from you first through posts and photos. So first we needed to charge the balloon....Micah was a great sport! Next we put it to the stream of water to see that the stream would pull towards the balloon, however that is hard to capture on camera. Very cool little experiment to do today! Easy schooling after the holidays! Thats cool! I have a balloon kid lol so this would be something she would enjoy!